Treacherous wildlife hunts, companion-swapping and a tragic impasse between Whites and Natives figure in the story of Eskimo, a lengthy, phenomenal tale of revenge among the Inuit population of northern Canada. This early talking picture, a stirring documentary/melodrama hybrid, makes for a worthwhile addition to the Warner Archive library of made-to-order DVDs. With this 1934 production, MGM returned to the melodrama-meets-exotic-cultures formula it mined so well on White Shadows in the South Seas (1928) and Trader Horn (1931). Bequeathed with the very first Oscar award for editing, this rugged story is told with proficiency and a whole lot of flair from Tarzan the Ape Man/The Thin Man director W. S. Van Dyke. Though modern viewers might snicker at some of the studio trickery involved, elements of Eskimo still have a hypnotizing power. With gorgeous photography, the movie portrays Native life truthfully and without condescension - offering a window into how these people really lived in the early 20th century. At its core, Eskimo tells a simple story of a hunter and Native leader attempting to preserve the way of life that his tribe has practiced for centuries. The fascinating lead performance of Ray Mala, an Alaskan-born actor, contributes one of the main things going in favor of Eskimo's authenticity. Mala plays a Native by the same name, a strapping young man who is hailed as the best hunter in his village. After hearing of the luxurious goods offered from a n ice-encased ship piloted by a white crew, Mala's companion, Aba, urges him to take her and a few others on the 500-mile expedition to the ship. 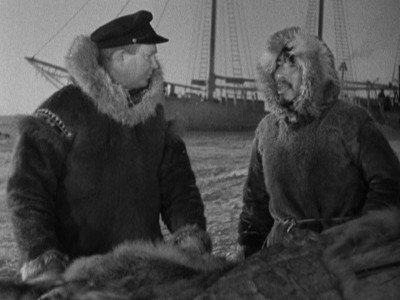 Upon arrival at the inlet of Tjaranak, Mala and his fellow natives find that it isn't easy negotiating with the ship's captain (gruffly played by Peter Freuchen, the Danish explorer whose books formed the basis for this story). Misunderstanding the male natives' practice of trading their companions as a form of gratitude, the lecherous captain decides to take Aba for a night of drinking and debauchery - as his reward for giving some of the ship's goods to the natives. 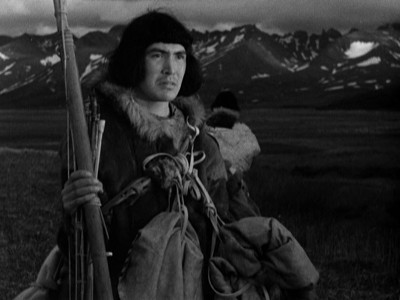 Returning from a hunt where he used a newly acquired white man's rifle, Mala learns that Aba was killed trying to get back to the native settlement. In a particularly tense, well-directed sequence, Mala confronts the captain and harpoons him to death. Shot on location in the Alaskan tundra, Eskimo takes on an entirely realistic, sympathetic view on Native culture. The relative merits of primitive Native life and the advanced, easily corruptible "White Man's Law" become apparent as Mala becomes a fugitive from Royal Canadian Mounted Police who are sent to his village to arrest him (in an interesting casting choice, the mounties' supervisor is adequately played by the director, Van Dyke). 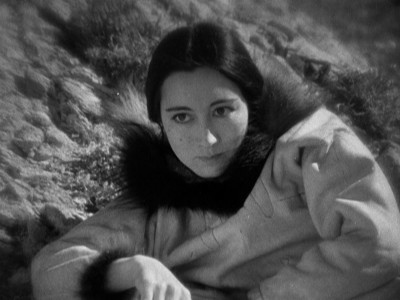 Mala returns to the village with an enlightened, more dignified perspective as he takes on a new companion, Iva (played by Lotus Long, an Asian-American Luise Rainer lookalike). When the arriving mounties witness that Mala is basically a good guy trying to preserve his family and village, they have serious misgivings about following through on their orders. Adding to Eskimo's unusualness is the fact that much of it is spoken in Native dialect, with the translations provided via title screens, silent movie-style. The intrigue-filled story grounds it in early '30s melodramatic convention, while the two hour-plus running time could have used some trimming. It's the stunning documentary footage that lingers in the memory, however. The movie boasts several set-pieces intended to wow a 1930s audience with majestic views of nature and hunting. 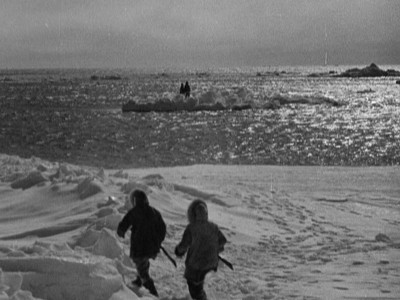 Studio recreations and back-screen projection are used in one such sequence, a walrus-hunting expedition. 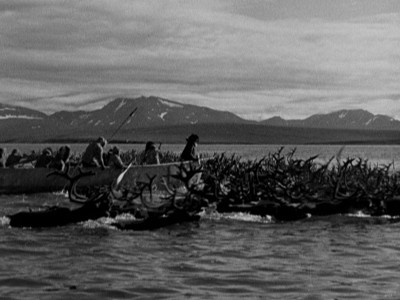 Depictions of hunting a massive caribou herd and a sperm whale are done on-location, however - and they still impress. I was also taken by several affecting, quieter scenes that show the dignity of Native life. Considering that they were guided by a man nicknamed "One-Take Woody" for his speedy filmmaking methods, they sport a startling beauty and lyricism. 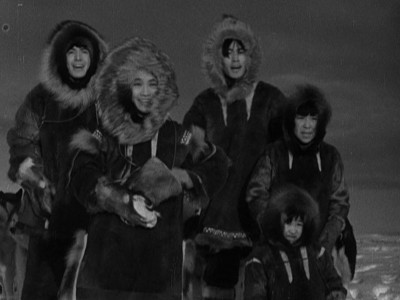 The Warner Archive DVD edition of Eskimo preserves the film's 1.37:1 aspect ratio in a nice presentation that well-serves the atmospheric black and white photography. The text screens appear to be fully restored, while the live-action segments are taken off a generally well-preserved print with some inherent flaws (a few scenes sport nitrate damage which resembles faint tree branches along the sides of the frame*). A few examples of white specks, dust and thin vertical lines crop up in an otherwise pleasant-looking, sharp picture. The film's original mono soundtrack is sonically what would be expected of an early '30s film, with some distortion and a lack of bass on the bottom end. Pops, hiss and other flaws show up occasionally, but it's a decent listen with no outstanding blemishes. No subtitle track is included on this disc. The disc only includes the MGM's battered original Theatrical Trailer, which sells the movie on its tense action sequences. What's the Inuit word for sensational? W.S. 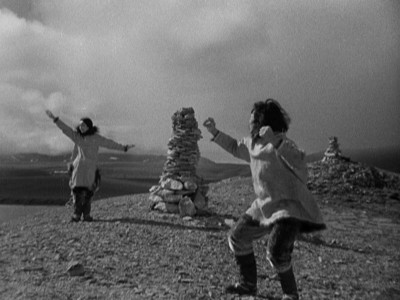 Van Dyke's Eskimo is a captivating, surprisingly non-patronizing drama of primitive life among the natives on the Arctic circle. The 1934 MGM production counts as one of those marvelous under-the-radar movies that emerge once every so often on Warner Archives. Highly Recommended. * A reader has informed me that Eskimo's tree branch-like markings came as a result of filming in Alaska's cold climate. As stated by George Feltenstein in the Warner Archive podcast, the freezing temps caused damage in the original prints - they're not the results of nitrate deterioration over time.